I have spent many weekends this summer in Asbury Park, New Jersey and I am really digging some of the boutiques there! And because I love to keep up with the latest trends when possible (and only when they won't cost me a small fortune)...I want to share some of my great recent finds with you guys. 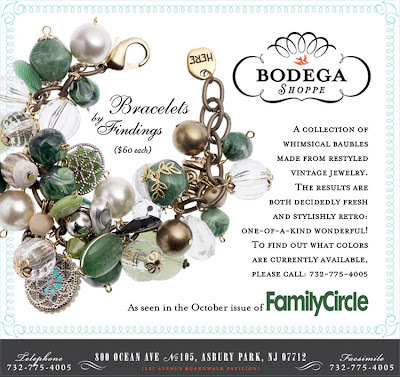 First is this bracelet from Bodega Shoppe right on the boardwalk. I was in the store last week and heard the owner on the phone saying something about a bracelet. As soon as he hung up I quickly asked what bracelet he was talking about and he pointed to this one saying "The phone's been ringing off the hook because it's featured in the October Issue of Family Circle magazine." Well that was music to my ears...I grabbed one in black for myself and a light purple one for my friend. The bracelets are made from vintage jewelry so they are truly one of a kind...and for $60 I am tempted to go back and grab a second one! 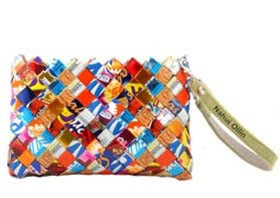 Next is this wristlet by Nahui Ollin which is made of recycled candy wrappers. I found it at a store called My Sister's Favorite Things on Cookman Avenue. Since it was my sister's birthday and I thought the name of the store was too cute...I bought one for her and couldn't help myself from getting one too. I like the concept of this bag and I think it's a great conversation piece, plus with all of the colors it goes with everything. The wristlets start at around $40 and the handbags can cost around $200- depending on which style you choose. I own like 5 Nahui Ollin Bags...I got mine right as they became popular a few years ago. Everywhere I go, I seriously get stares and never ending compliments on my bags. They are awesome. Great find. And I highly recommend your readers get one. Love the bracelet too. I want one now! Thanks for my Birthday gift, Lori! I wear it on my wrist to add color to my NYC-all black outfits. I love that it is colorful, light-weight, & environmentally friendly. Finally had a second to read. thank you sooo much! I really appreciate the shot out and love the way you write. i clicked on your pic and of course I remember you. Glad you love your bracelet!